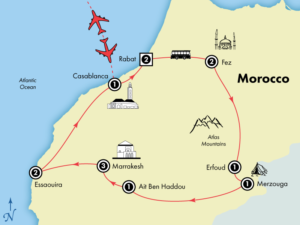 Begin your tour in Rabat, a heady swirl of color, culture, and history. Drive past the beautifully tiled entrance to the Royal Palace, followed by a stop at Bab Rouah, or the city’s “Gate of the Winds.” En route to Fez, stop at the UNESCO World Heritage Site of Volubilis. While exploring the sprawling medina of Fez, enter via the Bab Boujloud, or “Blue Gate” and visit the famed Al-Bou Inania Madrasa. Then, stop at the Chouara Tannery to see how leather is cut and dyed using traditional techniques. Adventure into Morocco’s Middle Atlas Mountains and stop in Ifrane, a Moroccan ski resort. Ascend scenic roads past pine groves and giant cedar trees, cross the 6,000-foot pass and continue toward the great Sahara, and enjoy views of the remarkable Ziz Gorges and vast valleys as you approach Erfoud. Explore the small city of Rissani, then venture into the Sahara Desert, where you’ll settle in to your camp to watch the dunes rise and fall around you then witness an incredible sunset. Gaze at the spectacular Todra Gorge, a deep ravine carved by the Todra River over millennia, before continuing to the Dades Valley, where roses bloom in profusion in springtime. 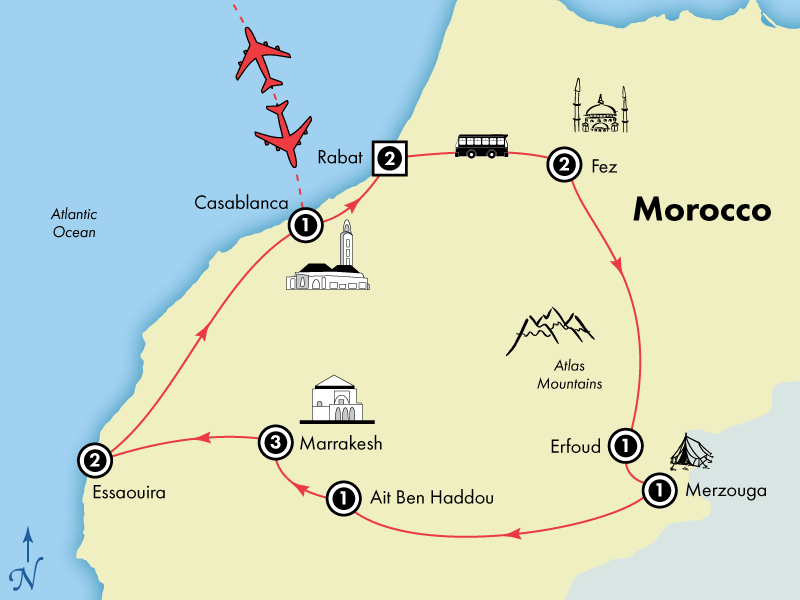 In magical Marrakesh, explore its 12th-century Koutoubia Mosque, Bahia Palace and the Majorelle Gardens. Wander the seaside town of Essaouira, with its bustling fish market and fascinating mix of ancient and modern sensibilities, then finally, discover Casablanca where you will see the fabled city’s important sights including the Mohammed V Square, Hassan II Mosque and the Royal Palace. Other departure cities available at various prices. This is an active trip. Our small group covers a lot of ground each day, and we spend 2-3 hours on our feet during tours. The pace is fast, with 4 one-night stays, 3 two-nights stays, and 1 three-night stay. Three days require long transfers by bus. Some of our tours require walking over uneven surfaces or up and down steep slopes or steps. We have many early mornings. This tour is not recommended for people who have difficulty walking or who have heart conditions.